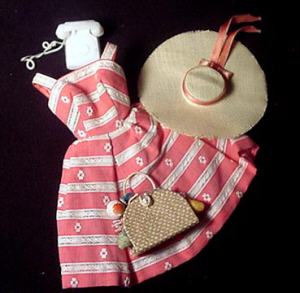 This was a new variation of one of Barbie's first ensembles, Suburban Shopper #969 (1959-1964). The two are essentially the same, except the Busy Morning sundress is orange instead of blue and the necklace was not included in this later version. The orange version is much rarer because it was only made for one year. The hat is especially hard to find and when found the edges are usually frayed. The hat should also have an attached headband inside to keep it in place. The back has a metal zipper.